Palazzo Zevallos, the site of the main Intesa Bank on via Toledo has a remarkable history, both architecturally and culturally. You'd really need one of those H.G. Wells The Time Machine time-lapse gizmos so you could watch a film of all 370 years of the existence of the building in a few minutes. You'd see workers scurrying about in a blur to put up the prolific Cosimo Fanzago's original Baroque marvel back in 1639 — the ornate facade, sumptuous portal in marble and piperno, the tiered internal courtyard, etc. ; then see all the changes — the fires and reconstruction on two occasions (Masaniello's Revolt in 1647 and the 1799 Neapolitan Republic) and see all the architectural add-ons and take-aways as the building changed hands a dozen times in all those years. The most significant change was in the 1920s, when it became the property of the Banca Commerciale Italiana (now Banca Intesa). Architect Luigi Platania adapted the building to its new function as a bank: the internal courtyard was transformed and made into a public reception room; the mezzanine was opened up with a series of art nouveau-style balconies, and the large empty space was covered by a glass roof in the floral style of the time. Outdoors became indoors. 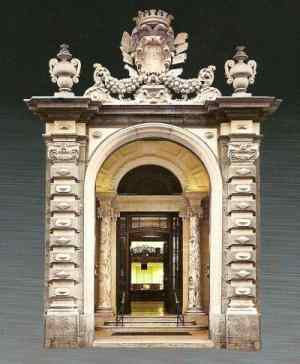 The only part of the building that retains the 17th-century Baroque characteristics of the original Fanzago design is the splendid entrance (image, right). Recent work has restored the 1920s remake of the interior: veined marble, wood, explosive colors. There really is a soft glow to the place as you walk in. Culturally, the most important change is that the piano nobile of the building (no, not a royal musical instrument, but rather the floor above the ground floor in large old buildings in Italy, where the view was better!) has been transformed into an art gallery. There are significant works by Gaspar van Wittel and landscapes by Pitloo of the Posillipo School; the centerpiece of the collection, however, is the last work of that unhappy and angry genius, Michelangelo Merisi, known as Caravaggio. The work is Martyrdom of Saint Ursula, done in 1610 in Naples. It depicts the brutal murder of Ursula by the king of the Huns. The truly interesting thing in the painting — that which draws the eye away from even the central act and grisly theme of the painting, itself — is that it contains another of Caravaggio's self-portraits; he has gone from his youthful rendition of himself as a delicate Bacchus, and later as the severed head of Goliath, to this — witness to a foul crime. He is one of only five figures in the painting, seen standing behind Ursula with utter anguish on his face, in torment to the point, perhaps, of only wishing release from the travail that was, indeed, his own life. That came to pass a short time later when he died ill and alone on the way to Rome. 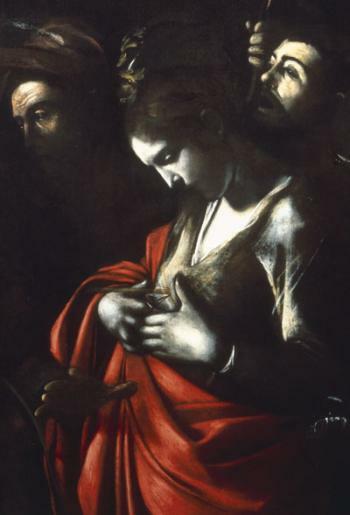 The painting ended up in the collection of the Banca Intesa after many years of wandering, indeed after many years of debate over whether or not it was even a genuine Caravaggio. As recently as 1963 it was displayed in Naples with a question-marked ascription to Mattia Preti. Scholarly opinion has now decided that it is the real thing. (I'm not sure what the problem was; maybe Ursula looks too serene—stunned but serene.) Restoration was done in 2003/4 at the Istituto Centrale per il Restauro in Rome. It confirmed the painting’s authenticity beyond doubt and restored the original dimensions (modified by an enlargement carried out probably in the 18th century). Martyrdom of Saint Ursula is on permanent display in the Banca Intesa, but has toured to other locations, notably the Borghese Gallery of Rome, the National Gallery in London, the Museu Nacional d’Art de Catalunya in Barcelona, and the Rijksmuseum of Amsterdam.